Discussion in 'Development Dispatches' started by moo1337, Oct 10, 2016. This development dispatch covers work completed since the Decred v0.4.0 release on September 06, 2016. Since then, developers have merged 102 pull requests into 9 repositories (see below for more detailed changes). * 0.5.1 was released with a dcrwallet bug fix for upgrading from very old wallet versions. Paymetheus users can safely use 0.5.0. All users are strongly encouraged to upgrade to this release. 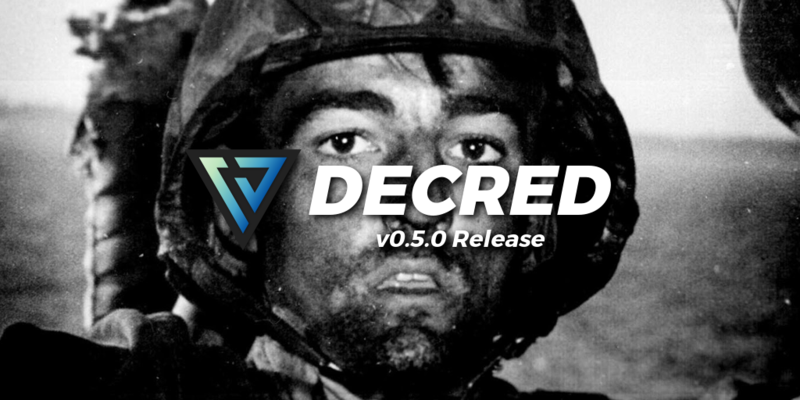 This release contains bugfixes and improvements to all of the decred tools (dcrd, dcrwallet, gominer, Copay, and Paymetheus). A new unified database for tickets and blocks has been added to dcrd. This provides significant performance and reliability improvements. gominer now supports NVIDIA GPUs using CUDA. gominer can now monitor temperatures and fan speeds on supported AMD or NVIDIA GPUs. The dcrd codebase has been modified to track the upstream btcd project more closely, allowing for easier copying of code between the two projects. Additional rpc tests have been added to dcrwallet (RFP-10). All changes since the last release are listed below. David, Reynold, zero and 6 others like this. Due to the database optimizations that are included in the 0.5.0 release, it is required that you resync and rebuild the chain. This document serves as an instruction set for people that would like to reduce their downtime off the network. If you don't have any issues with your wallets being offline for approximately 1-2 hours then you may just upgrade to 0.5.0 and relaunch your binaries. But due to the nature of voting, it is important for PoS participants to have as little downtime as possible. 4) This will begin the IBD for 0.5.0. Over a few different benchmarks (i7, 8GB RAM+, SSD) we've seen it take approximately 1 hr to complete. 5) Once you see it reach tip, you can ctrl-c to stop it. 6) Now you can stop your old version and then start your upgraded 0.5.0 bin and it should seamlessly grab the database that you previously synced. zero, Alexoz, Javed Khan and 2 others like this. Excellent, it appears the foundation has been laid for many great things to come. A huge thank you to all the devs who have worked so tirelessly on this project. jy-p and raedah like this. Good work! New version is syncing now. Migrate carefully to avoid down time. I'd also suggest to lower process priority of the upgrading dcrd so your live dcrd doesn't lag. Although there's no need to change the appdata dir according to ay-p's instructions. zero and jy-p like this. If you encounter this we recommend you stay on the version you were previously on. We are preparing a release patch and it should be ready shortly. What was your solution to fix it? Cold voting wallet updated. It was going smooth and fast, no issues. For now old DB will remain in hard disk for few days. I added the .exe as trusted in the firewall software. That fixed the problem. I must say the sync is awesomely fast. I love it. Great, we're currently trying to optimize a few more hotspots that can hopefully decrease sync time even more. Updated to v0.5.1 with no problem. Thanks to everyone involved for all the updates. Decred is moving forward, there is progress on v0.6.0 already. Over a few different benchmarks (i7, 8GB RAM+, SSD) we've seen it take approximately 1 hr to complete. I think the download speed someone has is also a factor. The new database at this point is about 690MB to download (about 80 MB less than the old one). The sync is way faster and since there is no separate ticket database shutting down (Ctrl + c) the dcrd.exe is also faster. When dcrd completely synced + 1 new found block I stopped it and remove the old database folder and files as @davecgh give here. (Of course it's better if someone keep them as backup for sometime). Then I restart dcrd and let it sync to latest block + 1 new found block and start dcrwallet again with no problem. (+ 1 new found block obviously is not needed but ever since I follow this I've never had a syncing problem so it's just a precaution). A choice for the installation location on dcrinstall will be a nice add in the future. Although there is no problem moving files afterwards. I like the progress on Paymetheus and it's needed to attract more users but I still prefer using the CLI. I hope in the future even if it takes a lot of time for Paymetheus to become more than a wallet, something like a Decred center where you can do everything from its gui even starting gominer. I also don't use dcrticketbuyer, I prefer manually setting my fees. I think it's more useful for big PoS stakers. Although I don't PoW anymore due to electricity cost, I've tested gominer v0.5.0 solo mining on Windows 10 x64 and its performance on hashrate is perfect. I have a R9 380 and the OpenCL version without ADL using blake256-old.cl gives a hashrate with default intensity (auto?) of about 1.22 GH/s (it takes sometime for the hashrate to stabilize) which is identical to what I can get from cgminer. Using the default blake256.cl it gives about 1.08GH/s. The OpenCL with ADL works with no problem on showing GPU temperature and fan speed but the hashrate stabilize at lower values about 1.11 GH/s using blake256-old.cl and 950 MH/s using blake256.cl. The CPU usage is close to only 1%, way lower than cgminer and similar to sgminer. Terminating gominer with Ctrl-c sometimes hanged gominer.exe and I'd close it from task manager. I think adding some functionality similar to cgminer and sgminer will be good for the future of gominer. If gominer is stable with PoW pools and the CUDA version gives good hashrate with NVIDIA GPUs then I think it's time for PoW miners to switch to it. I'm looking forward to see what's next for Decred. jy-p and davecgh like this. The --terminal issue is still there though. It needs LF. Is it bug reported? Edit: I've just heard, that you can use the v0.4.0 version of dcrctl. So it'll do for now. thanks for the detailed feedback, zero. getting CUDA support in for gominer was way harder than we expected, especially on windows. Just some feedback for gominer, I was not able to start due to missing cudart64_70.dll. I am running titan x pascal.with win 10 pro x64. Although, if it were linked with cudart_static.llb instead of cudart.lib it wouldn't require the dll. Should I sell my decred? The falling value and market cap is worrying me. Should I quit and take out all I can or just sit and wait for the storm to pass. Hahaha It's ok I think you can hold and think about something else!